First drive: New BMW 3 Series | What Car? Take a look at the revised 3 Series and it's like meeting a friend who's wearing new glasses you know something's different, but it's hard to put your finger on it. For the record, the bumpers, bonnet and side skirts have all been subtly restyled to give the car a more muscular appearance. It also features a curvier front grille, plus there are more intricate front and rear light clusters and new alloy wheel designs. Move inside, and the makeover is limited to some different trim materials on standard cars. However, specifying sat-nav brings an improved version of BMW's iDrive control set-up. This has shortcut buttons for commonly used systems such as the radio and navigation, so you no longer have to scroll through onscreen menus to access them. As a bonus, each button is a slightly different shape to help you find the one you want without taking your eyes off the road. BMW's engineers have also been busy, with the headline news a new 3.0-litre turbodiesel unit that generates 242bhp and a whopping 384lb ft of low-down pull. That's 14bhp and 15lb ft more than the old 330d model, yet fuel economy is up from 46.3mpg to 49.6 (for the manual saloon). At the same time, a cut in CO2 emissions sees the 330d drop two company car tax bands, giving it a lowly 21% rating. To put this in perspective, the rival Audi A4 3.0 TDI sits in the 25% band. Then there's the way the new engine delivers its performance. Peak torque is available from 1750rpm through to 3000rpm, so even if you're lazy with the rather notchy manual gearbox it continues to pull strongly. Alternatively, rev it hard and you'll out run most hot hatches the 0-62mph sprint is dispatched in just 6.1 seconds. BMW's old 3.0-litre diesel engine didn't take kindly to this sort of treatment, becoming a bit rattly towards the top of the rev range. However, the new one sounds pleasingly meaty when worked and is near-silent during less strenuous activity. 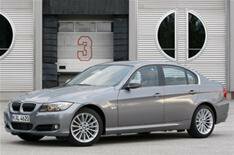 Elsewhere in the range, the 325d and 335d have both been tweaked to improve performance, fuel economy and emissions. What's more, every model has a slightly wider stance now to aid high-speed stability. You'll arrive at the end of a long motorway slog feeling relaxed and ready to work, then, and the 3 Series also does the business on twisty routes thanks to strong grip, excellent body control and communicative steering. Okay, the ride is on the firm side, but it's still perfectly acceptable.